Magical Poland. The most famous and interesting places in our country. An absolute must if you want a thorough flexible introduction to Poland, its history, culture and the unparalleled spirit. You will get to know the interesting capital of Poland – Warsaw and a magnetic seaside city of amber – Gdansk. Welcome meeting at the airport or the train station with our driver who will take you to the selected centrally located hotel in Warsaw. Rest of the day free for leisure. Recommended activities: viewing terrace on the 31st Floor of the Palace of Culture and Science, museums: Warsaw Uprising, Fryderyk Chopin or the Museum of the History of Polish Jews. Morning: After breakfast, enjoy a four-hour introductory tour of Warsaw. 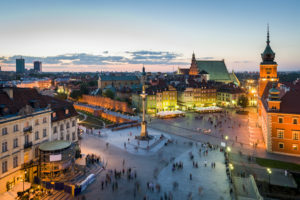 It will include transfers and the very best of the city: the charming Old Town painstakingly rebuilt from scratch after WW II, the area of the former Jewish Ghetto, the busy downtown, the elegant Royal Route and Łazienki Royal Gardens. Morning: We’ll arrange transfer to the railway station, where you will board the express train to Gdansk. The journey shouldn’t take more than 3 hours. In Gdańsk our local driver will welcome you at the arrival platform and transfer you to the hotel. Afternoon: Meet one of the best local guides to explore the historic city, in particular one of the most extraordinary markets in Europe. You’ll see the Golden Gate, Town Hall, Neptune fountain, the Arthur’s Court and the Green Gate. Later on, you’ll have an opportunity to see the symbol of the city – the Old Crane as well as the St. Mary’s Church. At the end of the tour a walk on Mariacka street, which is the most famous street in Gdansk, situated between Brama Mariacka and the St Mary’s Church. You will be amused by the cobblestones, old burgher houses with their perrons and elegant mini-terraces you’ll see at the place. This is the best area to enjoy a cup of coffee and buy some of beautiful amber jewelry. A visit in a small amber museum is included in the program. A full day private tour with your personal, English speaking driver who will take care of all the arrangements. This day you will see three different cities that have one common name: Tricity, because of their location next to each other and the connections between them. Morning: You’ll go to the Gdansk shipyard, which is a place where Solidarity movement was created, there you’ll see a Monument to Fallen Ship Workers and a famous gate to the shipyard. Next point of the itinerary will be the Cathedral of Oliwa – a Cistercian church, famous for its organs, which you might be able to listen to. Afternoon: You’ll be taken to the Gdynia harbor, visit the sail ship ‘Dar Pomorza’, and then you’ll be transferred to Sopot. Boasting beautiful beaches and ritzy resorts, Sopot is also known for its Wooden Pier (the longest in Europe) and lively Monte Cassino Street. You’ll have a chance to take a walk by the promenade and the pier. Transfer back to Gdańsk. The tour is recommended for min. 2 participants. The single occupancy price for only one participant (one person private tour) is also possible.